An invaluable reference to the 18th century African Slave trade. 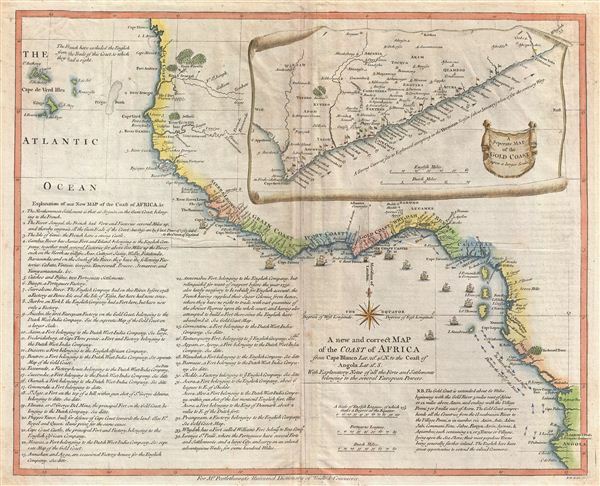 A new and correct Map of the Coast of Africa from Cape Blanco Lat. 20°, 40'. N. to the Coast of Angola, Lat. 11° . S. With Explanatory Notes of all the Forts and Settlements belonging to the several European Powers. An important and very interesting 1855 map of western Africa by the english publisher M. Postlethwayte. This map covers the west coast of Africa from Cape Blanco and the Senegal River southwards past Sierra Leone, the Grain Coast, the Ivory Coast, the Gold Coast, the Waydah, Benin, Calabar, the Seven Hill, and Majumba, to Angola. An inset in the upper right quadrant details the Gold Coast. Sailing ships can be seen plying the coast and arrows identify the seasonal trade winds. An elaborate explanation fills the lower left quadrants, with fortifications and settlements along the coast numerically referenced. Annemboc Fort, belonging to the english Company, but relinquished for want of support before the year 1730. Also lately necessary to be rebuilt for english account, the French having supplied their Sugar Colonies from hence, where they have no right to trade with vast quantities of the choicest Negros upon the whole coast, and having attempted to build a fort there since the english have abandoned it.This map was engraved by R. W. Seale for issue in Postlethwayte's 1755 edition of the Dictionary of Commerce. Malachy Postlethwayt (c. 1707 - 1767) was a British economist and commercial expert famous for his publication of the commercial dictionary titled The Universal Dictionary of Trade and Commerce in 1751. The dictionary was a translation and adaptation of the Dictionnaire économique of the French Inspector General of the Manufactures for the King, Jacques Savary des Brûlons. Malachy claims to have spent nearly 20 years adapting and researching his important dictionary, which attained a popular following. The second edition of the Dictionary issued in 1752, was updated with a series of fine maps based upon D'Anville's work, but updated by Postlethwayt to reflect his political and social views. Politically Postlethwayt was extremely conservative and highly patriotic though his views more often than not took the form of rants against the social and political enemies of the British Empire. In the mid-1740s Postlethwayt lobbied for the Royal Africa Company and was known for his pro-slavery advocacy. His belief that the slave trade had a place in the larger "political arithmetic" of empire, promoted through his many popular books and other publications, in time became the party line for the ruling class. Despite his misguided feelings about the Africa slave trade, Postlethwayt was an influential and thoughtful economist whose ideas influenced Adam Smith, Samuel von Pufendorf, Alexander Hamilton, and others. Postlethwayt also commonly spelled his name as Postlethawyte and Postlethwait. Postlethwayte, M., Mr. Postlethwayt's Universal Dictionary of Commerce, Vol. II, (London), 1755.